802.11ax (also known as Wi-Fi 6), a next-gen high-efficiency Wi-Fi standard, was created. Now, you can simultaneously connect more devices and enjoy the optimum speed for each of them. 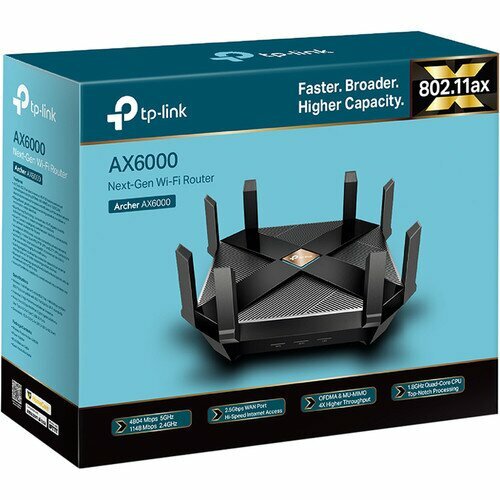 The Archer AX6000 is TP-Link’s first router with next-generation 802.11ax Wi-Fi technology. Take your Wi-Fi to the next level while being backwards compatible with 802.11a/b/g/n/ac Wi-Fi standards. BSS Color technology ensures smooth and stable connections by eliminating signal interference, while beamforming and Rangeboost deliver stronger and far-reaching network. With OFDMA and MU-MIMO technology, Archer AX6000 provides up to 4× higher capacity and throughput compared to standard AC routers in dense usage environments, greatly increasing the number of connected devices. 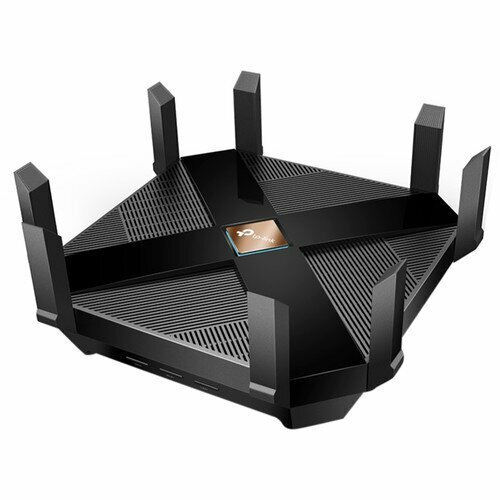 8 high-gain external antennas deliver a strong Wi-Fi signal throughout your home. BSS Color technology ensure smooth and stable connections by eliminate signal interference probably from your neighbors, while beamforming and Rangeboost deliver stronger and far-reaching network. 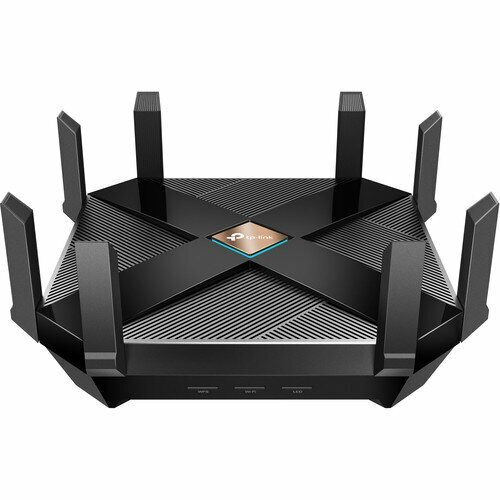 The Archer AX6000 provides a 2.5Gbps WAN port to make fully use of the over 1Gbps internet access, boost the whole internet throughput. one Type C and one Type A USB 3.0 ports and eight Gigabit Ethernet ports also help to transfer data at blistering speeds for peak performance. An extremely powerful 1.8GHz 64-bit quad-core processor with two distinct co-processors and 8Gb of RAM powers through multiple complex tasks and demanding applications with ease. 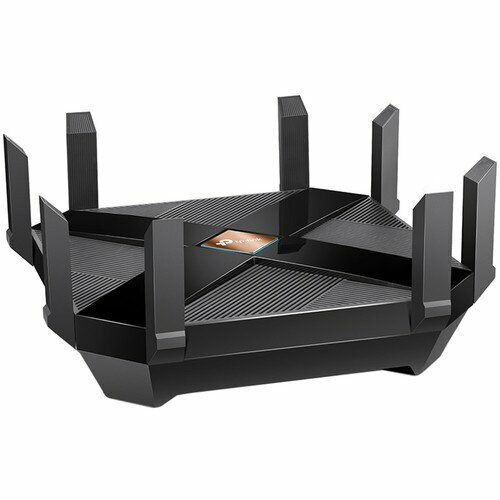 Its processing power allows the router to support multiple high-demand applications at the same time. TP-Link HomeCare ensures every device on your network remains protected, with a threat database updated live by Trend Micro. Use the powerful parental controls to limit time spent online and block inappropriate content according to unique profiles created for each family member. 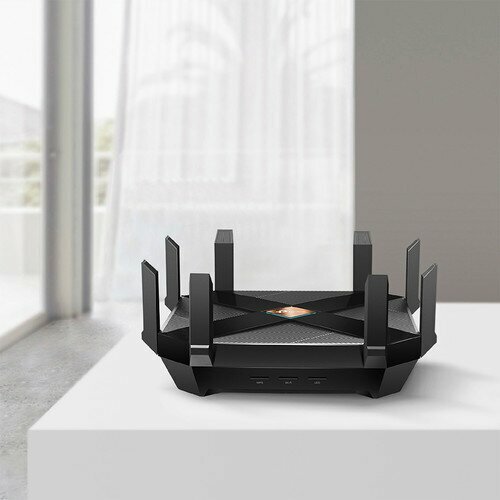 To set up the Archer AX6000 via Bluetooth, simply download the Tether app, follow the on-screen instructions, and get your network up and running in minutes. With IFTTT, you can trigger actions when devices are connecting, disconnecting, or being added to your network. You can even choose to prioritize certain devices every time you use them.